Boots No7 for Beautiful Skin! I’ve heard about Boot’s for years now, but didn’t see any of their products in US store until recently in Target – where they have become more widely available. And while the US has been slow to distribute the beauty brand, Boots has been a staple for over 160 years in the UK – and the No7 brand is the number 1 cosmetics and skincare brand in the UK! So you can bet that I was pretty darn excited to receive a sample of Boots No7 Beautiful Skin Cleansing Lotion and Beautiful Skin Night Cream (both for Normal/Dry Skin) in my Beauty Bloggers VoxBox! The Night Cream claims to energize and help promote optimum hydration for healthy radiant skin. Now I have super sensitive acne prone skin, so I’m always wary of products promising to hydrate my skin- because I usually end up doing an emergency pore cleansing mask afterwards to deal with breakouts caused by overly-thick creams. 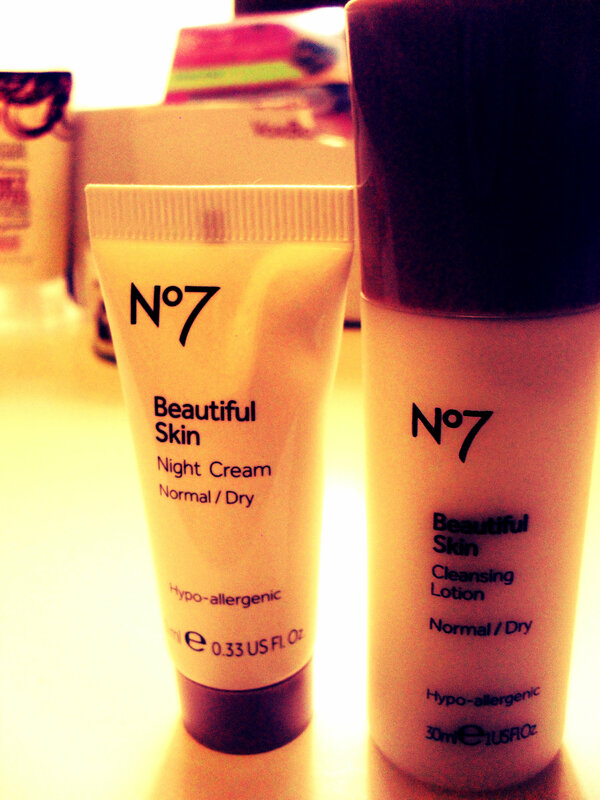 However, no joke, the No7 Beautiful Skin Night Cream was as light as silk and left my skin feeling like a baby’s! It has a subtle scent that I found to be quite nice and not overbearing at all. 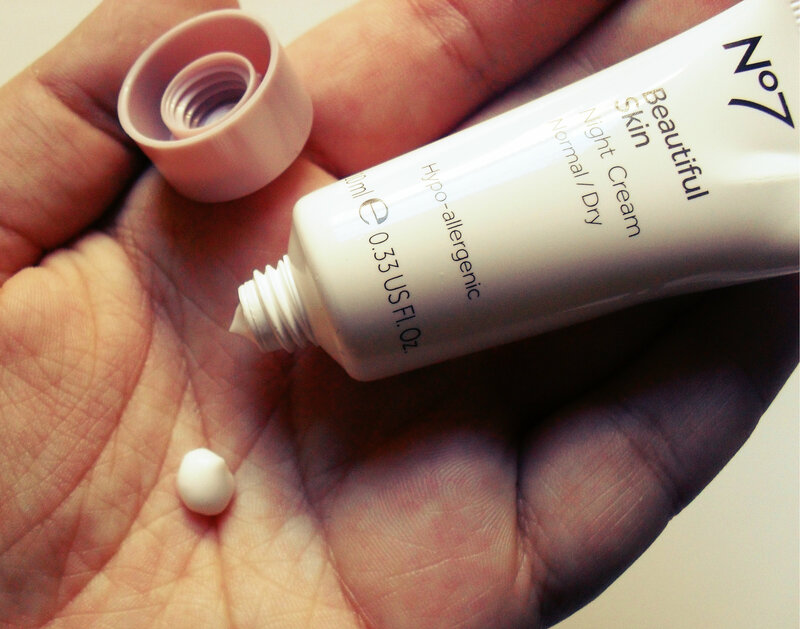 Also, the cream absorbs really well into the skin – so you won’t have any oily residue left behind or anything. I actually never understood cleansing lotions before my experience with Boot’s No7 Beautiful Skin one. I usually scrub the makeup off my face using makeup wipes, wash up with my foaming cleanser and call it a night. However, makeup wipes tend to be really abrasive and leave my eyelids dry and red – and never fully rid me of my makeup on its own. But this No7 Cleansing Lotion is where it’s at! It was super light, and literally took all my makeup off in one shot. It doesn’t really have any scent, and you just apply the tiniest bit to your eye/face rub it around and then wipe off. No dry, red eyes and no makeup! I used it to rid my hand of eyeshadow when I was taking photos for my NYC Individual Eyes swatch and review – it worked like a charm! I’m really loving these two products and can’t wait to try the rest of Boot’s No7 skincare line, as well as their makeup offerings – you can find out more about Boot’s and what they offer here! Have you had any experience with Boot’s and their cosmetics and skincare products??? Let me know in the comments below! Next Post Beauty Blogger VoxBox Review!